Meet Tannie Maria: She’s fifty-something, short and soft (perhaps a bit too soft in the wrong places) with brown curls and untidy Afrikaans. She is also the agony aunt for the local paper, the Klein Karoo Gazette. One day, her life takes a sinister turn when a woman in the area is murdered and she becomes entangled in the investigation … to the intense irritation of a handsome local policeman. where you can let go, unwind and get lost in an addictive world of entertainment. the full experience of the story’s intended plot and atmosphere. 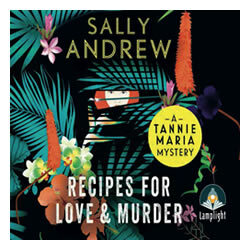 Listen in your car, at home, in the gym, en route to your holiday destination, wherever... you'll be captivated by the emotional freedom that comes packaged with every audiobook you hire, download or buy. The Rental Library offers an exciting catalogue of over 1 100 top titles - mainly complete and unabridged - on CD and a growing catalogue of over 70 titles on Playaway. or a set units contract. 1 000's of exciting titles on CD for purchase. We perceive our range of material for retail as perfect for the collector with its repeat value. An audiobook also makes a fantastic gift for friend or family.